Here I will explain how to extract or unzip files in zip folder in asp.net using C#, VB.NET. In previous articles I explained create zip files in asp.net, Delete files from uploaded folder in asp.net, create/delete directory in asp.net, Ajax ConfirmbuttonExtender example with modalpopup, Joins in SQL Server and many articles relating to Gridview, SQL ,jQuery,asp.net, C#,VB.NET. 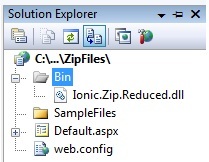 Now I will explain how to extract unzip files from zip folder in asp.net using C# and VB.NET. lbltxt.Text = "File Uploaded Successfully"
lbltxt.Text = "ZIP File Created Successfully"
lbltxt.Text = "Files Extracted Successfully and it contains following files"